When a single tooth is missing, the two most common treatment options are the traditional tooth supported bridge and an implant supported crown. When a traditional bridge is used to replace a missing tooth, the adjacent teeth are cut down into peg shapes in order to fit the cemented bridge in place. This method of tooth replacement can be very esthetic and functional for a period of time. 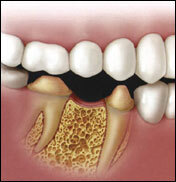 However, a tooth-supported bridge does not replace the bone that previously surrounded the root. Since there is no longer a root to hold the bone in place, the bone deteriorates, or melts away. Tooth replacement with a traditional bridge requires cutting down the adjacent natural teeth. The bridge is made up of two crowns to cover the natural teeth and a false tooth to serve as a space maintainer. Tooth replacement with a dental implant and crown replicates the anatomy of a natural tooth and does not compromise the adjacent teeth.